It’s that time of year when I take a few much needed days off to relax and spend even more time than usual concealed away in dark cinema auditoriums for the Edinburgh Film Festival. I’ve not had a proper holiday in far too long – this time last year, on the very first day off for the film festival I got a call to say dad had been rushed into hospital, so I spent a good chunk of that week off going back and forth to hospital in Glasgow, most of the remaining holiday days I had for the rest of the year were saved to use up later as I knew when dad finally went for his surgery and in his recovery afterwards I’d need days off. So to say a whole week off just to relax and enjoy a variety of world cinema is a welcome relief is an understatement. This afternoon was my first FF screening. Taboor is one of those movies that make me go to film festival screenings – I don’t know anything about it apart from the single paragraph description in the festival programme (unusual for most flicks I see as I keep up with film reviews, interviews etc, so rarely see something I don’t know anything about), and what I find is odd, unusual, different – delightfully so. Vakilifar’s Iranian film defies labeling (which is often a good thing) – ostensibly it is a simple tale, following the nocturnal work of a solitary, middle-aged, silver haired and bearded (rather dignified looking) man as he goes around the quiet, night-time streets of Tehran on his motorbike and sidecar, carrying out his work as an exterminator. But to tell you that, while accurate, really doesn’t tell you much, because this is less a film about narrative, or indeed even about character interaction and more about an experience, one of those films you are simply taken into and feel rather than follow. It makes for an engrossing film-watching experience, but it does make it damned difficult to convey in a review just why you enjoyed it so much! The film is mostly wordless – it is a good half hour before we hear a single human voice, and even then it is a voice-over, for just a few moments (indeed the few other moments of speaking will also be as voice overs, not as dialogue, we never actually see two characters speaking to one another, which adds to the unreal atmosphere pervading this film). That small voice over is one of the very few bits of exposition in the film, as the man is visiting a hospital for a full body scan. Following the scan a doctor takes him (again with no dialogue between them) to an old lift and down to a shabby basement kitchen, where, for no apparent reason, he throws a piece of meat from the fridge onto a skillet. As the cinema stares at the animal flesh shrinking in the heat, curling, smoking, spitting fat, the voice over remarks that he had tried to warn the man that his condition is getting worse, that this is what is happening to him, to his internal organs, which for some never specified reason are being cooked from within by microwave radiation which he seems unusually sensitive too, and the condition is accelerating, despite his elaborate precautions. Precautions? Well right at the start we spend several minutes watching the man wake in a single room in a converted trailer; the room is entirely lined in aluminium foil, walls, floor, ceiling, no windows visible. 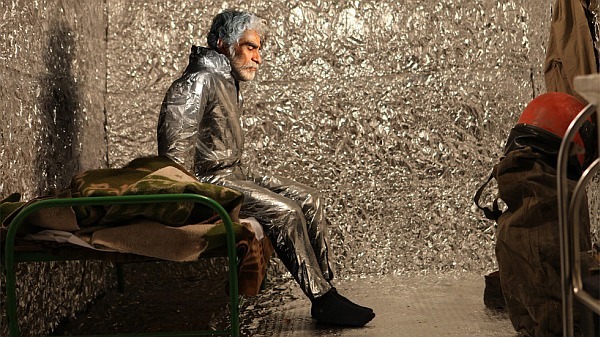 Rising from his bed in the almost monk-cell like silvery chamber the man dons overalls also made of shiny foil, before donning trousers, a large jacket with hood, buttoned right up and then a motorbike helmet with extra material coming off it over his neck and shoulders, reminiscent of some firefighter’s helmets. Obviously thoughts of paranoid obsessives worried about secret CIA projects trying to read or control their mind leap to mind and it is only half an hour later we get this tiny fragment of information to explain why he lives and dresses as he does. But the reason behind it really isn’t terribly important, this is more an odd night-trip through a largely empty city, the urban world at night, streets, houses, road and rail tunnels, all lit up so we can see clearly but that feeling anyone who lives in a city gets, that the light is somehow false, that those artificial lights let us see our way around our cities after night but that those lights make everything, from buildings to roads to trees to people, look different than the natural light of day does. Vakilifar clearly has a love of perspective – many shots are static, fairly long sequences – the point of view of our man looking down a city highway and tunnel at night, the lines and curves running away into the background, a long hospital corridor, an underground railway tunnel, even the opening shot of his solitary room in his trailer. No cuts and dissolves here from long shot to medium to close up, the bulk of the shots are very static and usually lined up on some interesting perspective (a particularly effective sequence sees the camera stay filming the same shot as our man is lead to a door, the double doors open, he walks through a hall to identical double doors which open to lead to another set, all without the camera’s perspective changing. It creates a kind of detachment, as does the lack of close ups or personal interaction or dialogue, leaving us as observers, also sometimes reminding us of the voyeuristic nature of cinema (an inexplicable scene with the man, naked save for underwear and a metal bin over his head, standing at the end of a long corridor being shot at by a pellet gun underlines this voyeuristic feeling, while the man’s near naked, head covered post is reminiscent of those horrible shots disgraced US troops took of abused prisoners in Abu Ghraib). 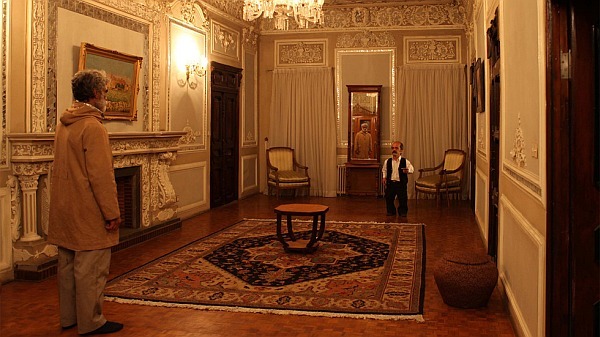 The film is full of odd scenes and imagery, with the work of David Lynch, that inference of the odd and weird just hidden below the surface of seemingly normal, everyday places and people, a very strong influence (right down to another unexplained scene which sees our man calling on a client not to exterminate bugs but to stand in a richly decorated room regarding an expensively dressed dwarf in the other corner). The empty, night-time urban cityscapes also hint at influences such as Michael Mann (like Mann some beautifully shot nocturnal cityscapes, occasionally accompanied by very atmospheric, ambient music, which is used sparingly) and also Ridley Scott (in what I presume is an in-joke as the man and doctor silently share an elevator the muzak in the lift is a version of Blade Runner Blues from Vangelis’ soundtrack for that film). 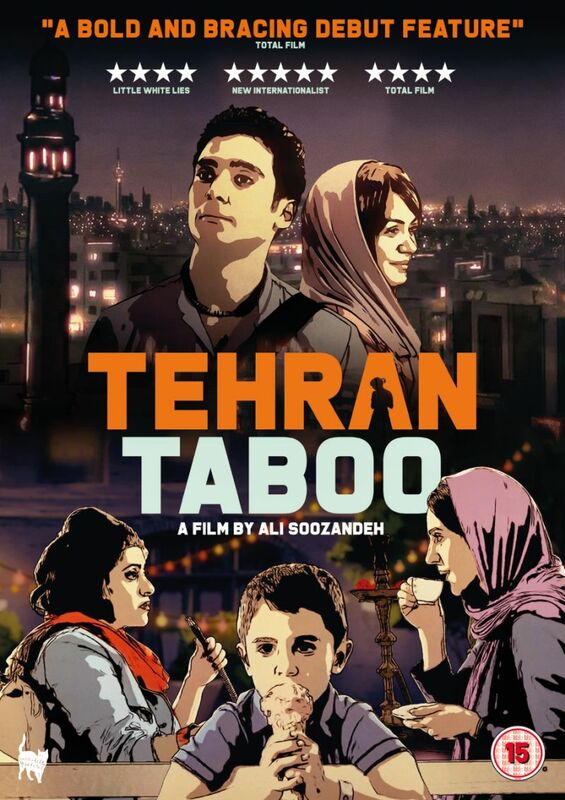 It’s a very odd piece of film-making from Iran, hints of Lynch, Mann, Jim Jarmusch and more. The lack of dialogue is replaced with a hyper-realised soundtrack, where the silence is filled with noises from the rustling of the man’s foil suit to footsteps, echoes, clunks and clicks of doors – like Berberian Sound Studio (an offering at last year’s film festival) even when it appears little is happening the soundscape creates a hugely atmospheric feeling, while the lack of explanation and dialogue and the distance the camera keeps from the man (he is never named), rather than alienating the viewer instead draw us in, inviting us to imagine narrative, be a part of the film, while the odd scenes, the static long shots and the mostly empty night time scenes the man travels through create a very dream-like feeling. I suspect some will find it tedious or dull, it’s certainly not for everyone, but personally I found it compelling, drawing me into this odd, solitary, isolated night-time, mostly unexplained life and man. This isn’t really the sort of film that you can explain easily to someone why you like it, it just touches some viewers and draws them in. Certainly did for me, one of the sort of films I love to find at film festivals, odd, unusual, compelling and the sort of thing I’d probably never get to see screened outside of a festival setting. In a move which surprised many those laid-back lovers of multiple viewpoints and open debate that are the wacky guys in the Iranian government/religious police (hard to tell them apart) have been deeply offended by something. This time not newspaper cartoons from neighbouring Saudi, not the film and comic of 300 (and before that Alexander) or the film and comic of Marjane Satrapi’s Persepolis or… okay you get the point, they are a bunch of whining twonks who declare everything they dislike is deeply offensive to their nation and obviously the Prophet, blessings be upon his name and all of Islam (which naturally they feel entitled to talk on behalf of all). What are the daft smeggers upset about now? Well Salman Rushdie was awarded a knighthood in the Queen’s birthday honours list (sadly there was no such honour for me), which the Iranians claim is a deliberate attempt to insult them and Islam because Rushdie wrote the Satanic Verses several years ago. You may remember good ol’e Krazy Khomeini, that laugh-a-minute mullah with a twinkle in his eye and a song in his heart declaring a fatwah against it and offering a huge reward to any of the Faithful who murdered one of the most respected novelists in the world for insulting Islam in a work of fiction which he hadn’t actually read. Oddly they don’t mention how insulting it is to all civilised people to burn books and threaten the life of writers you haven’t even bothered to read; as a devout follower of the church of freedom of speech and a disciple of the Tower of Books I find their attitude highly insulting to my beliefs and I declare literary jihad on their infidel arses. Of course, our form of literary fundementalism is more civilised – we don’t place death sentences on their heads, we want to capture them, tie them to a chair and force them to read books. That will teach the bastards.